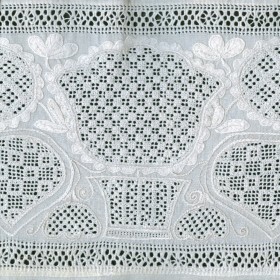 The technique known today as “Schwalm Whitework” (see also: Typical charac­teristics of Schwalm Whitework) originated around the beginning of the 19th century. 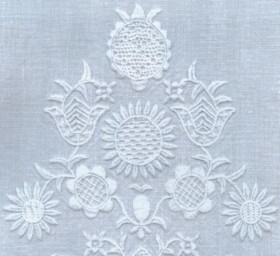 However, there was a forerunner of the Schwalm Whitework we know today. 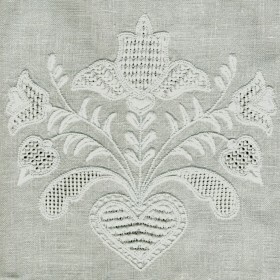 “Early Schwalm Whitework” originated around the middle of the 18th century. 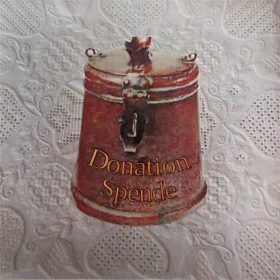 One finds Schwalm embroidery mainly on richly decorated bed coverings, parade cushions and decorative towels, women’s bodices and men’s shirts, decorative handker­chiefs for particularly festive occasions, and on baptismal clothes. One may view such embroideries in “Museum of the Schwalm” in 34613 Schwalm­stadt Ziege­nhain, Germany (http://www.museumder­schwalm.de ) and in “Schwälmer Dorfmuseum Holzburg” in 34637 Schrecksbach-Holzburg, Germany (http://www.dorfmuseum-holzburg.de). 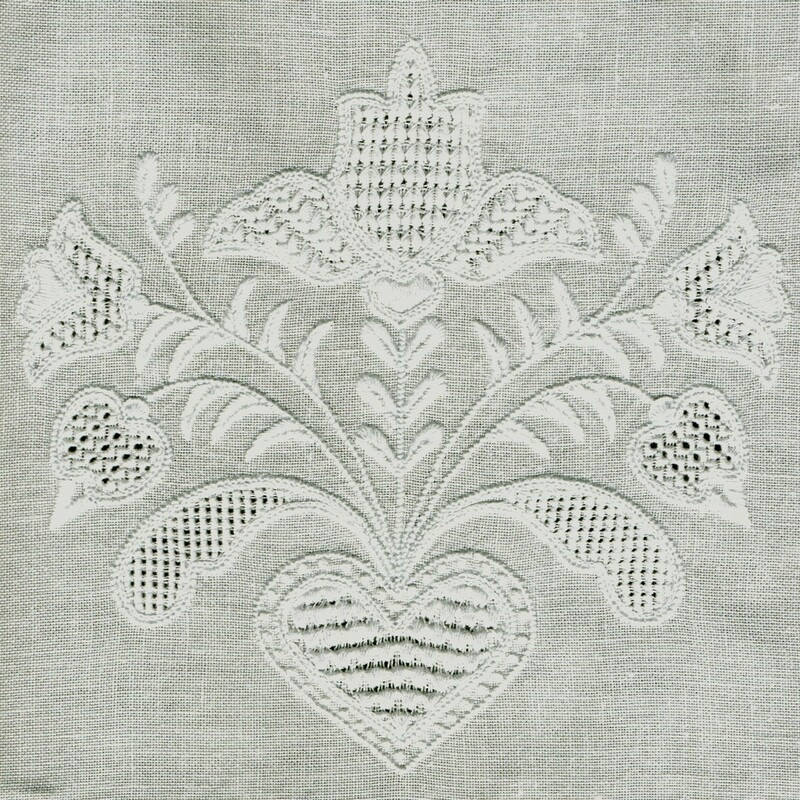 With the First World War (1914-1918) the original Schwalm Whitework experienced a first decline. Mrs. Alexandra Thielmann (1881-1966) worked to reverse the trend. She created a workshop and employed young women and girls. 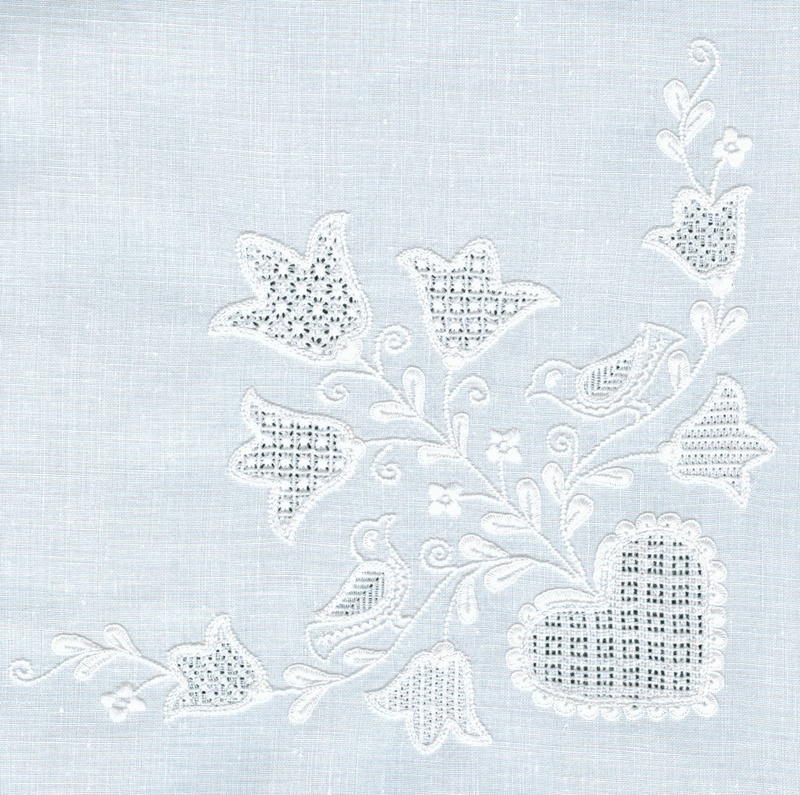 Her new designs, made predominately for table linens, were embroidered in her workshop and sold all over Germany. Another period of decline for this embroidery came after the Second World War (1939-1945), in the middle of the 20th century, when the local people sought a more “modern” life and began to shun the traditional costume. Of course, there were many women who opposed the loss of traditional arts and crafts. backg­round. In Germany today, the technique does not dominate in surface embroidery. It is, never­theless, practised by an impressive, although ageing, number of women. And yet, again, we see a resurgent interest in Schwalm Whitework. Globalisation and the Internet age have helped to introduce this unique embroidery to people all around the world and more embroiderers are eager to learn and practise it. Numerous books, of varying degrees of quality, have been published in different languages. They serve not only to preserve the rich tradition of Schwalm Whitework, but to move the art form into an even more rich future. 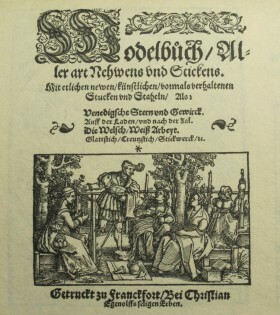 The first Model­books were developed around the beginning of the 16th century when access to typog­raphy was becoming more common. The Model­books were popular and they were found all over Europe. There were models for counted-thread as well as for free-style embroideries. The counted-thread patterns remained the same over centuries, while the free-style designs were subject to strong change. 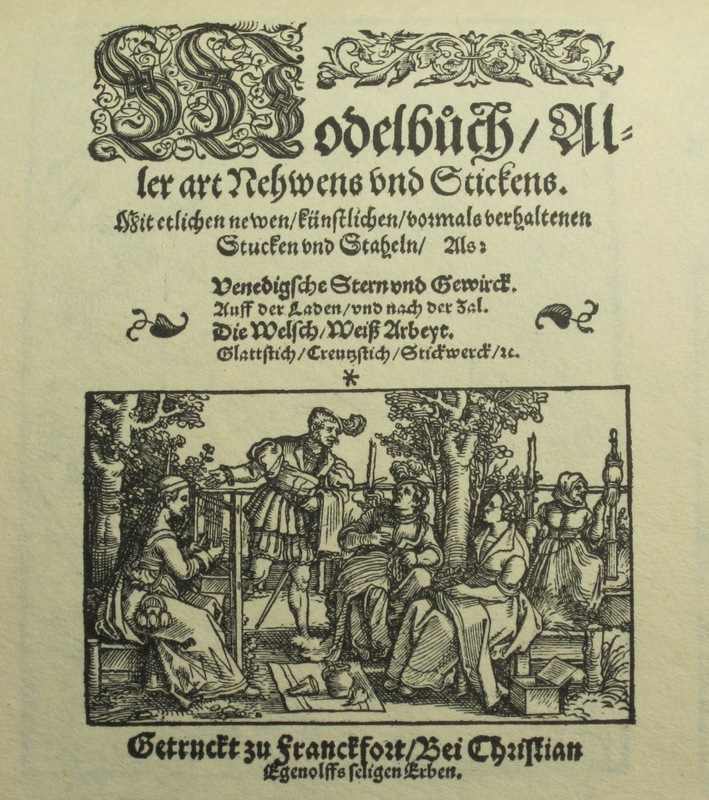 Not many people could afford the acquisition of an expensive book, and so the samples were shared by drawing. Thus, it was inevitable that, over time, slight inaccuracies and deviations developed leading to very different patterns in the different regions of Europe. 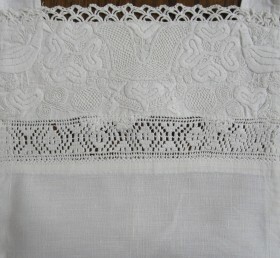 However, not only were the sample designs modified, but also the techniques were constantly subject to the individual embroider’s inclinations Leisure time, aesthetic preference and the enthusiastic ability of individuals led to the fact that, by the exchange of single elements, the embroidery was modified and gradually changed. The original designs show densely filled borders comprised mostly of large motifs such as hearts, tulips, circles and baskets or flowerpots. 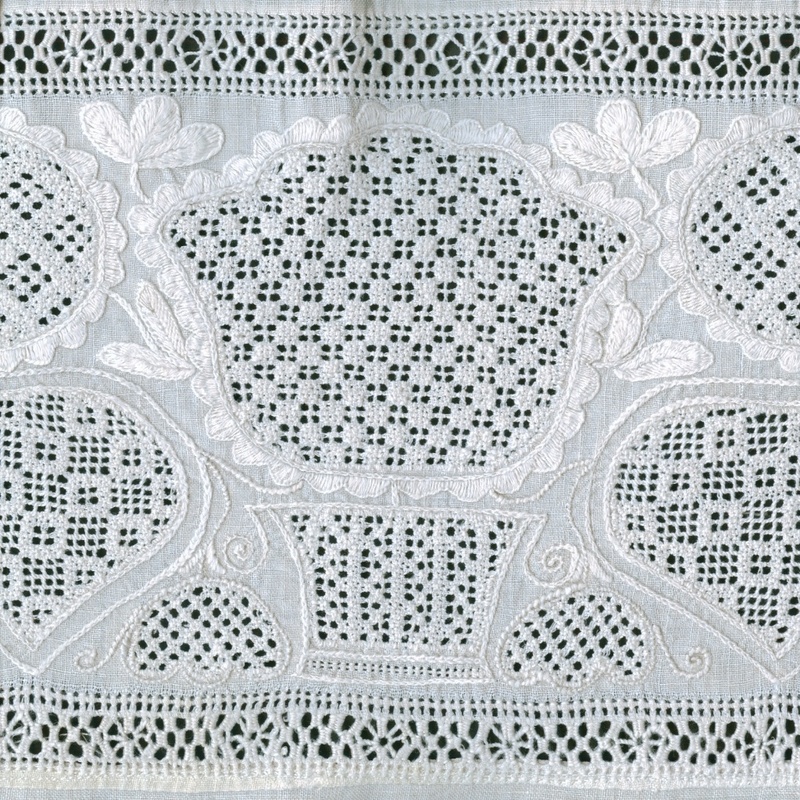 These motifs were embroidered with very different drawn-thread work patterns. The outlines of the motifs, the stems and the tendrils were stitched in Coral Knots. Open areas between the large motifs were filled with small leaves, small flowers and tendrils. Those borders were usually worked with Four-Sided Hem stitch or Peahole Hem stitch. 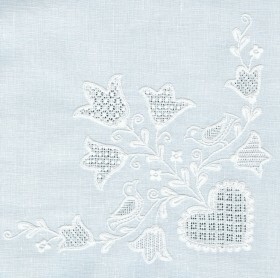 However, a finish of Needlewoven Hems and sometimes an additional small border was also common. In this delightful technique, the same motifs (hearts, circles, tulips and other flowers) and some unique motifs are shown in similar arrange­ments. Birds were rare as were the spiral-shaped tendrils. Instead of these, a multitude of small leaves were used. 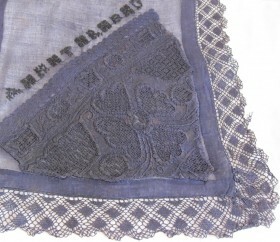 In addition, Stem stitches take the place of Coral Knot stitches and the motifs are not filled with drawn-thread patterns, but with stitches that lie on top of the fabric. Between these two styles there was a transitional period from which we see embroideries with stitches, again, lying on top of the fabric and Satin stitch patterns as well as Coral Knots. Bed coverings – like this from the year 1876 – were richly decorated at the top and most commonly along the side which faced into the room. They were turned back at the top. This meant that they were partly embroidered from the front of the fabric and partly from the back so that the patterns of the cuff (the turned back section) were seen from the right side. “Parade cushions” were large pillow­cases. 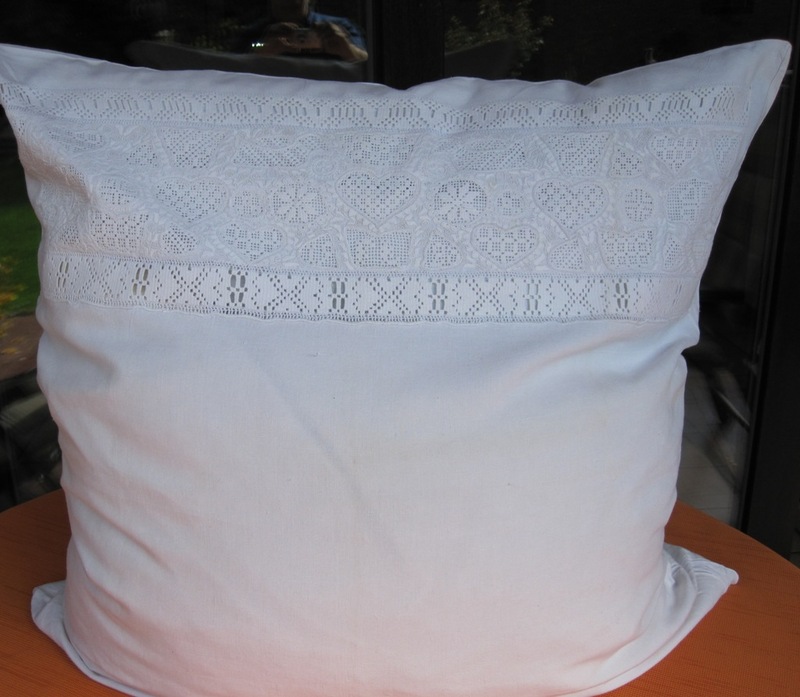 The pillow insert was tightly stuffed and made of red ticking so that the Needleweaving hems and splen­didly embroidered borders were shown to their best advantage. The patterns “brag”, as we say in the vernacular. Parade cushions and bed coverings were used only during special holidays and for decorative purposes only. Most of the women’s bodices were worn under waist­coats. This meant that the fronts and backs were kept very simple. 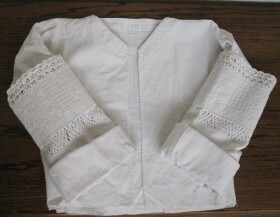 The cuffs of the sleeves were decorated all the more with wide pattern borders, extravagant Needleweaving hems and elaborate Needle lace. There also were bodice jackets. These were also elaborately embroidered and embe­llished with Needle lace at the front edges. 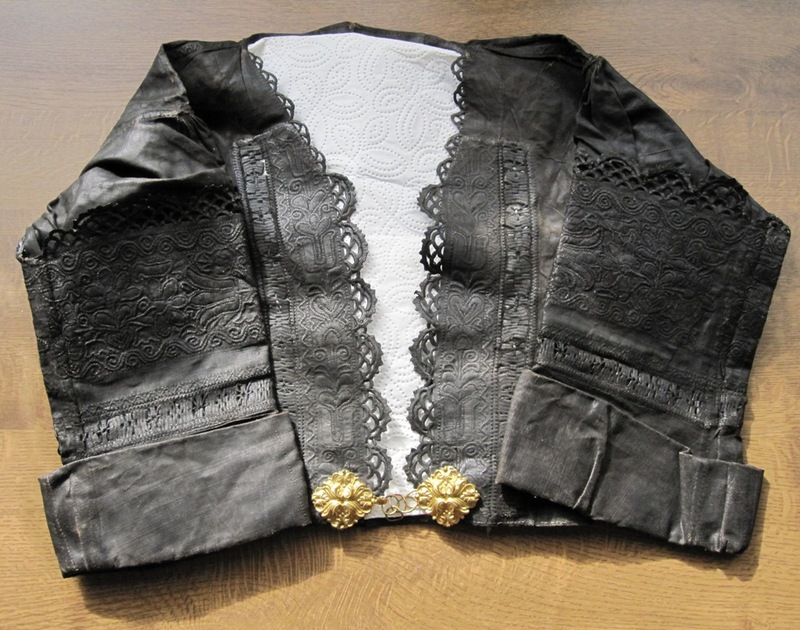 Sometimes the bodice jackets were dyed to blue or black after the embroidery was finished. Especially elaborate jackets were given a shine with wax. Men’s shirts, made for holidays and special occasions, show fine embroidery and Needle lace. 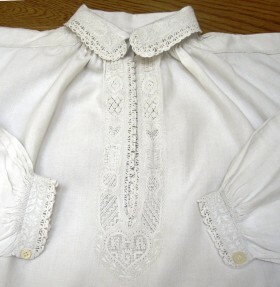 Sometimes, we see additional Needleweaving hems at the collars, the cuffs and the necks. 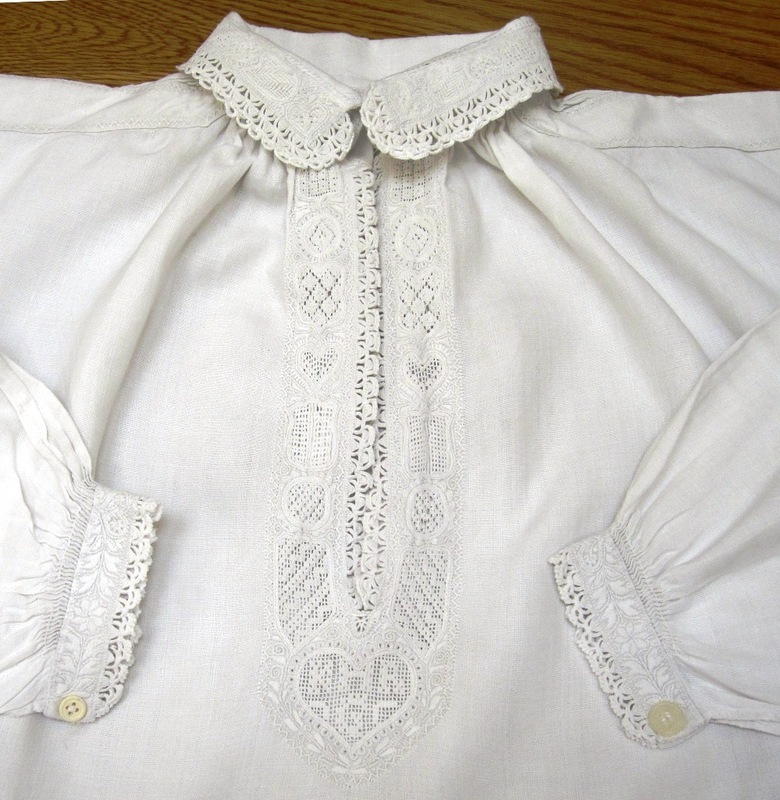 Shirts for grooms were elaborately embroidered and provided with a “crown” in the back. To the Lord´s Supper masses and to very high holidays, one wore handker­chiefs as a decoration. 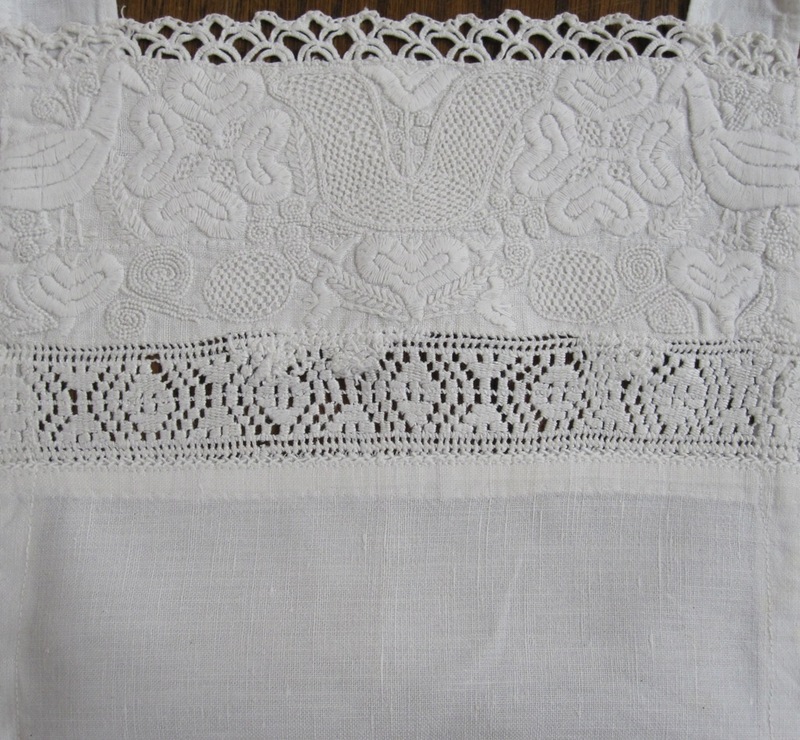 They were made from finest linen cambric, embroidered at one corner and edged with bobbin lace. These pieces were dyed to blue after finishing. With the decline of the traditional costumes, combined with the decline of the strict rural way of life, one looked for another use for the embroidery. Naturally, a transfor­mation of the designs occurs at this time also. Alexandra Thielmann (1881 -1966) dusted off the old drafts and sketched new flower shapes. In nearly all her designs one finds many, pointed-edged leaves. She accomp­lished two important tasks at one time: she succeeded in adapting the designs to the preferences of the time, and the designs were not so time consuming to work. Today, her designs are still popular. With these designs, children´s dress of all kinds, women´s dress, fine handker­chiefs, under garments, bed linen, pillows, and altar cloths were embroidered. 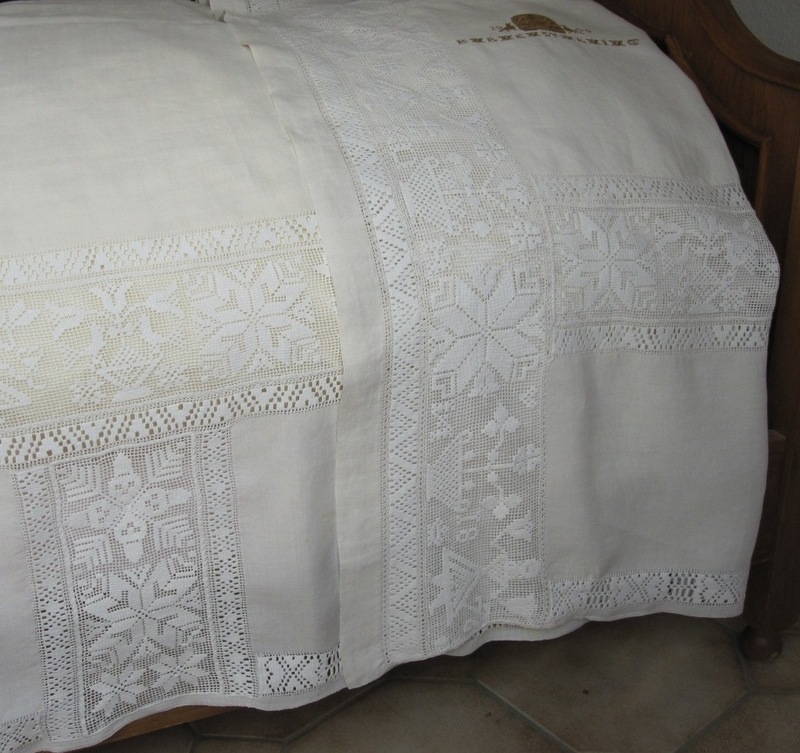 However, tablec­loths were embroidered in her workshop (estab­lished at the beginning of the 20th century) for “Schwälmer Bauer­nstic­kerei” (Schwalm farmer embroidery) and sold all over Germany. Thekla Gombert (1899 -1981) again brought the designs up to date. Clean, smallish shapes, and rounded or a multitude of small leaves were her typical style. 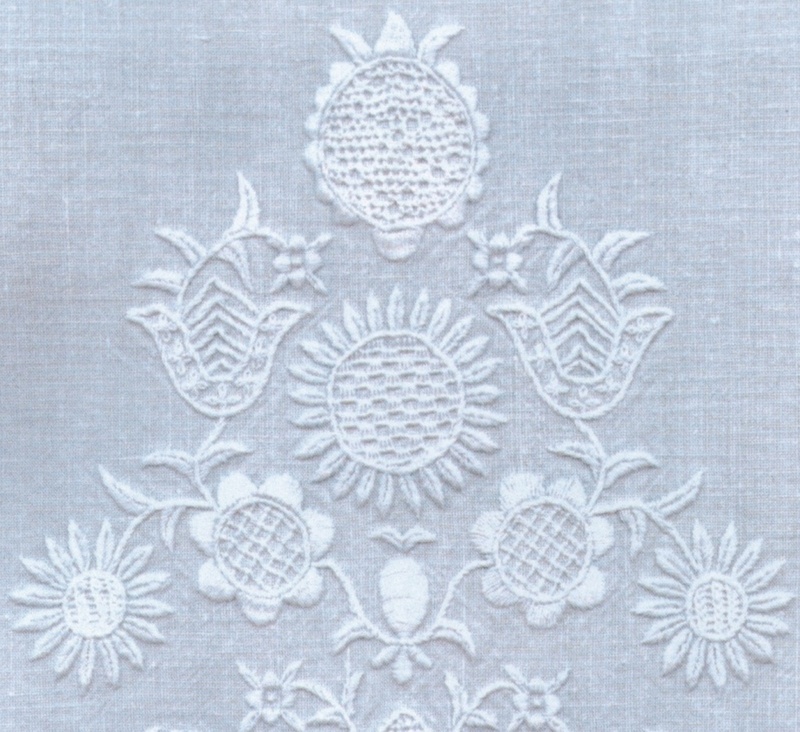 With the publication of her instruc­tional books at the end of the 1960s, she made an important contribution to the preser­vation and promotion of the technique known as Schwalm Whitework.